On June 2, 1879, Lord Chelmford, Commander-in-Chief of British troops in South Africa, “regretted to report” to the Secretary of War of the United Kingdom, Lord Stanley, an event that would spread rapidly throughout the world: the death of the prince imperial of France. 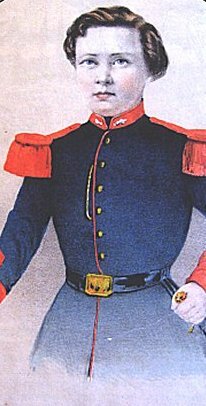 The prince imperial in the uniform of the foot grenadiers of the Guard, approximately 1865. –Anne S.K. Brown Military Collection, Brown University, Providence, Rhode Island. Author's collection. With him died the final, faint hopes of his supporters for the eventual return of the empire to France. He was well and truly dead in combat against the Zulu warriors in a remote location known as “Zululand” in southern Africa. Many of the circumstances that had brought him to this tragic end surprised the public. Some even suggested that his fate put an end to a life filled with misfortune. Born on March 16, 1856, and baptized with great ceremony in the Cathedral of Notre Dame, Napoleon Eugene Louis Jean Joseph Bonaparte had for godparents His Holiness the Pope and Queen Victoria of England, for the child was the son of the Emperor Napoleon III and the Empress Eugenie. He was the heir to the French Empire. Raised in one of the most prestigious courts in the world, in 1870 he witnessed one of the most unfortunate pages in French history: the campaign that led to the disastrous capitulation of the French Army at Sedan. The Prince Imperial, at the time 14 years of age, accompanied his father during this campaign. Just before the capitulation to the German Army on September 3, the Emperor succeeded in having his son escape, first to Belgium and then to England. The day after the capitulation at Sedan, the Empire fell and the Third Republic was proclaimed. On September 8, the empress joined her son in southern England. On March 20, 1871, the former emperor rejoined them at Chistlehurst after his German captivity. Miserable, ailing, and discouraged, Napoleon III passed away on January 9, 1873. For his part, the prince imperial was certainly shaken by these reverses of fortune, but he did not lose his courage. Like his father, he was interested in artillery. It was thus natural that he would focus on a military career. In 1872, he was accepted as a cadet at the prestigious artillery school of the British Army at Woolwich, where he was a brilliant student who graduated on February 16, 1875. A commission in a British artillery regiment was inappropriate, given his birth and his political situation. On the other hand, he could serve on the staff. After his godmother, Queen Victoria, expressed a desire to the Duke of Cambridge, commander-in-chief of the British Army, the prince was attached to his headquarters. During the next several years, various rumors concerning him circulated in the upper echelons of British society. Sometimes the stories were of a re-establishment of the imperial regime in France, while at other times they were of royal marriages, for example to Victoria 's youngest daughter, Princess Beatrice. These rumors were false, however. Despite this mundane existence, punctuated by parades, grand maneuvers, and work in the offices of the general staff, the young prince was nonetheless an officer with an unsatisfied ambition to participate in a true military campaign. 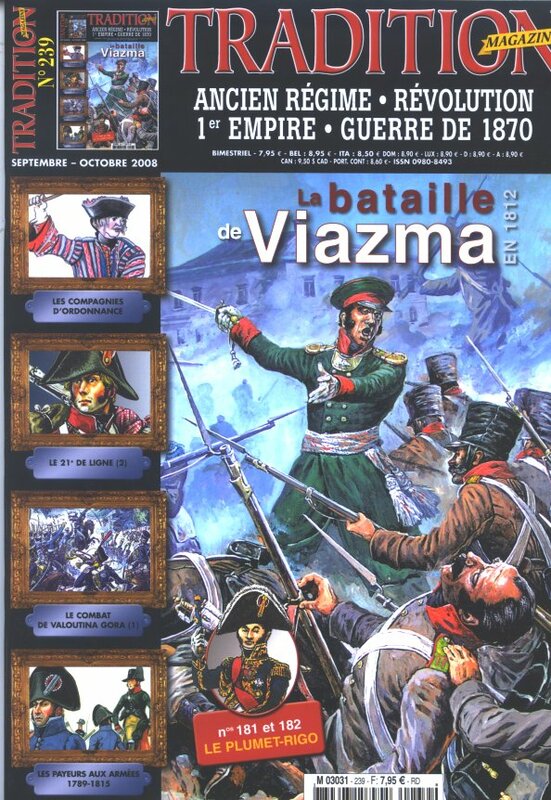 This was even more so because, as the years passed, the possibility of returning to France as Napoleon IV became virtually nil, the Third Republic being very popular at home. More than ever, the prince sought to prove himself by a gallant action. It was thus that, on March 31, 1879, he arrived at Durban, in South Africa , furnished with letters of introduction from the Duke of Cambridge and Sir Lintom Simmons, the commandant of the Woolwich school, addressed to Lord Chelmford, general-in-chief in South Africa. Despite these excellent letters of introduction, Lord Chelmford spent most of his time in the north with his troops, and did not have time to receive the young prince. At the time, the commanding general of troops in South Africa had to deal with great troubles in the northeastern portion of that large colony. The Zulus were ravaging that area, and particularly the Natal province. The complicated origins of this conflict may be summarized as being a product of British territorial expansion, which brought them into conflict with the empire of the Zulus. Although some Englishmen disdainfully described these warriors as “tribes of savages,” in fact they formed a powerful federation of African nations equipped with a truly remarkable military system unequaled since that of Sparta in ancient Greece. During the decade of the 1870s, violent incidents increased as the colonization of Natal grew. The British sought to define the border based on the sadly erroneous vision of their high commissioner, Sir Bartle Frere. 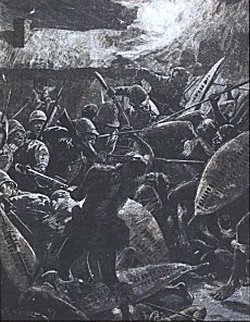 Of his Zulu counterpart, King Cetywayo (also called Cetshwayo), Frere wrote that he had “the belief common among savages that we [the British] ceded solely because of weakness.” In consequence, British troops needed to secure the threatened province and make the Zulus understand that force was not on their side. Frere's understanding of the situation was based on the beliefs of the Boers, descendants of Dutch colonists who had established themselves in South Africa during the Seventeenth Century. It was primarily the Boers who had farms and villages in the Natal. Yet, despite having no cordial relations with “the blacks,” the Boer leaders did not believe that war with the Zulus was the solution to resolve their differences. The government in London had no clear idea of what seemed to be a local issue that could be resolved by authorities on the spot. Nonetheless, London specified that war should be avoided. Frere saw things otherwise. For him, the Zulus constituted a threat not only to the Natal but also to neighboring territories, a threat that he had to confront. Thus, at the beginning of January 1879, a contingent of British troops moved to the “frontier” of “Zululand” in the northern part of the Natal. The campaign began without major problems and, on January 11, three British columns advanced into enemy territory. The Zulus initially offered only a slight resistance. All this changed on January 22, 1879. On that day, the center column, consisting primarily of the 24 th Regiment of Foot, had camped at the foot of a steep hill at Isandlwana. Suddenly, in a flash, thousands of Zulu warriors—perhaps as many as 20,000 men—attacked the camp. Surprised, the British troops attempted to repulse them, but these African warriors were of an unequalled bravery. Few had firearms, but all employed their short spears with skill, whereas some of the British soldiers lacked ammunition. The British collapsed and the camp was invaded. The precise number of victims is unknown, but 600 to 800 soldiers perished under the blows of the Zulu warriors. This was one of the worst disasters in the history of the British Army. the 24 th Regiment of Foot at Isandlwana, January 22, 1879. In the rear, the steep hill dominated the area. After this battle, approximately 4,000 Zulus decided to launch an assault against the entrenched camp at Rorke's Drift, a small garrison based on a mission west of Isandlwana that had been transformed into a field hospital. It was defended by only 139 officers and men (including 35 who were hospitalized), of which the majority belonged to the 24 th Regiment of Foot. Using improvised defenses, this small group repulsed the successive assaults of hordes of Zulu warriors. This defense was even more surprising because the attackers had the courage of lions. The British defenders also did not lack for heroism, and eight of them received the Victoria Cross, the highest British decoration, for their feats of arms. For, contrary to all expectations, Rorke's Drift did not fall. The incredible resistance of this detachment inflicted heavy losses on the Zulus and saved northern Natal from invasion. The British thus succeeded in maintaining a defensive line west of the Tugela and Buffalo Rivers. In 1879, South Africa was not yet linked to Britain by telegraphic cable. The news of the disaster at Isandlwana did not reach London until February 11; all England was horrified, and public opinion pressured the government to order the immediate dispatch of troops from home. The cruiser HMS Shaw, anchored at Saint Helena, sailed to Durban to disembark a unit of 400 sailors; 650 men of the 57 th Regiment arrived there from Ceylon (the modern Sri Lanka.) In the following weeks, successive contingents of troops continued to disembark at Durban. Thus, at the end of March, when the prince imperial arrived, Lord Chelmford was organizing an army to proceed to a full-fledged invasion of “ Zululand.” Deployed on the banks of the Tugela River, this army included elements of the 1 st King's Dragoon Guards and 17 th Lancers for cavalry, with the 3d, 13 th, 21 st, 57 th, 58 th, 60 th, 80 th, 90 th, 91 st, and 99 th Regiments of infantry, plus detachments of engineers and artillery with field pieces, rocket launchers, and two Gatling guns. This did not count detachments of the 24 th, various South African volunteers, and local levees raised from the African population. On March 24, a detachment of the 80 th Regiment was lost in an ambush north of Rorke's Drift. On the 28 th, the British suffered another reverse at Hlobane, but dispersed the Zulus at Kambula the next day and at Gingindlovu on April 2. The Zulus had the numerical advantage, besides being excellent warriors in a well-organized army that the British had come to respect. By contrast, these warriors had no modern firearms except the excellent Martini-Henry carbines taken from the soldiers killed at Isandlwana. They did not know how to employ these rifles correctly, so that their fire was ineffective. 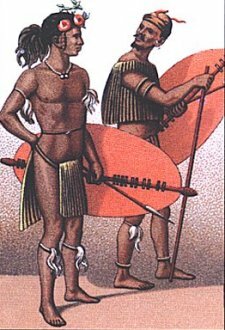 The short spear known as the “assegai” remained the principal weapon of the Zulu warriors, who also carried large leather shields. The encirclement tactics that had made them famous was also known to the British headquarters. By contrast, thanks to the numerous British reinforcements that arrived in South Africa , Lord Chelmford soon had more than 10,000 men under his orders. Employing a numerous cavalry, of which two regiments were from the metropolis, the British redoubled their reconnaissance to avoid surprises. Confidence again reigned in their camp. It was during this phase of operations that the prince imperial joined Lord Chelmford's army, initially posted near Rorke's Drift. He was attached to headquarters and particularly to the intelligence section; this was undoubtedly at his request, because he wished to encounter the Zulus. Between May 13 and 20, he participated in two reconnaissance missions in enemy territory, where he had a disquieting tendency to pursue on horseback any Zulu warriors whom he spotted in the bush. These very agile individuals escaped him. Upon hearing of this behavior, Lord Chelmford, who dreaded the political consequences of anything happened to the prince, ordered him to remain at headquarters. This restriction continued until June 1, when the entire British army began its advance into “ Zululand.” In the confusion of orders and counter-orders, the prince imperial succeeded in returning to his preferred location with the outposts of the army. The prince assumed command of Lieutenant Jahel Carey's patrol, which included five soldiers of the 17 th Lancers and an African guide. With these men, he departed on a patrol towards the north, seeking a good site for the encampment of a portion of the army that evening, as well as to collect cartographic information. About three in the afternoon, the prince decided to halt at an abandoned camp to brew coffee and take a rest; the Zulus seemed to be far away. It was here that events went wrong. In fact, a large number of Zulus were quite close, discovering the patrol and attacking about 3:15 p.m. The enemy was armed with carbines, although according to Lieutenant Carey their fire was very inaccurate. However, one of the soldiers fell, wounded in the back, while the others attempted to mount up and escape. A second soldier was killed. The soldier Cochrane, who was the last to see the prince imperial, related that the prince, unable to remount his horse, fled as fast as his legs would carry him, pursued by several Zulu warriors. The result was inevitable; the prince had no chance of escaping these men of Olympic stature who could cover dozens of kilometers per day in the bush. Two revolver shots were heard. the British lost only 13 soldiers killed and 78 wounded. When the survivors returned to the army's camp with this news, a troop of the 17 th Lancers set out for the site of the incident. The lifeless, naked body of the prince imperial was found on June 2. The surgeon major conducted an autopsy, finding that the body had been pierced by 18 spear wounds. All the wounds were inflicted on the front of the body, indicating that his end almost certainly came about in the following fashion: realizing that he could not escape his pursuers, the prince imperial discharged his revolver while facing them, succeeding in fired two shots before he succumbed under the blows of their spears. It was in this manner that Lord Chelmford wrote the dispatch cited at the start of this article. The news of the prince imperial's death provoked even more emotion in Britain and France than had the disaster of Isandlwana. Opinion on both sides of the English Channel demanded that someone be held accountable for the prince's death, and Lieutenant Carey became the scapegoat. Summoned before a court martial, he was found guilty of fleeing in the face of the enemy rather than aiding the prince, and was condemned to be expelled from the army. However, there was a reversal when this judgment went for confirmation to the office of the Duke of Cambridge, commander-in-chief of the army and a friend of the young prince. According to the duke, “the accusation is not supported by the facts,” an opinion shared by a number of critics. 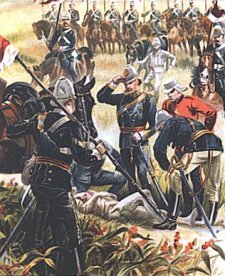 In effect, it was difficult to conceive how, after having already lost two men, Carey could have saved the prince imperial with the three soldiers remaining to oppose a group of the redoubtable Zulu warriors. 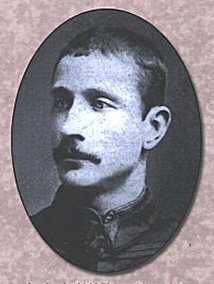 Carey was pardoned on August 16 and re-integrated into the army. By so doing, the duke gave a salutary signal that, for the army, war was not a romantic adventure. The prince imperial, born among the great and promised the throne of France, had a destiny encumbered by mischance that finally defeated him. As for the campaign in Zululand, Lord Chelmford's army continued his progress towards the north. On July 3, the Zulus under the command of King Cetywayo made a final attempt to halt the British at Ulundi. 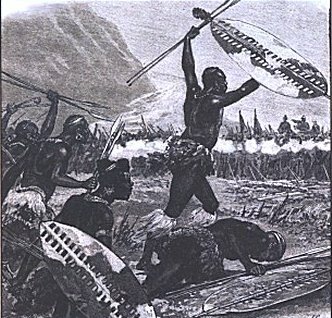 Despite all their heroism, the 20,000 Zulu warriors could not shake the firepower of the British troops who fought them at close range. 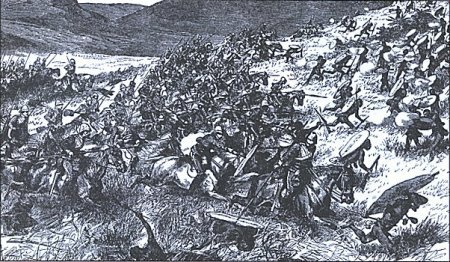 A charge of the 17 th Lancers drove the Zulus to retreat in general disorder. 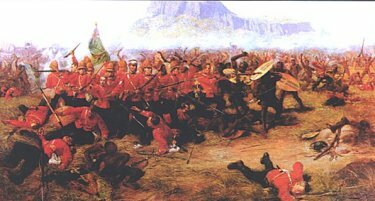 The Zulus lost about 1,500 men killed or wounded, while the British lost only 91 of whom 13 were killed. This was the death knell of the great African federation. Zululand became a British colony in 1887 and was ultimately annexed to the Union of South Africa in 1907. Stein, C. “The End of the Zulu War, 1879,” in Battles of the Nineteenth Century . (London, c. 1898), Vol. II, pp. 614-627. Stephenson, Charles. “The Curious Case of the Prince Imperial,” Osprey Military Magazine, Vol. IV, no. 3 (2002).